Start your apartment search early so you have options. If you wait until the last minute, you might be forced to take an apartment you don't really like only because it's pet-friendly. Six to eight weeks before your current lease ends should give you enough time. Your pet is your "child," but a potential landlord sees through a more practical set of eyes. 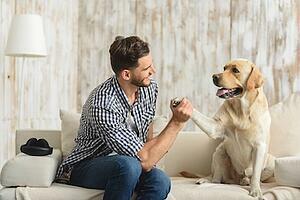 Pets in an apartment can mean damages, noise and even potential safety risks. Approach leasing with a pet as a privilege, not an entitlement, and you'll get a much better reception. If an apartment community has a blanket no-pets policy, cross them off your list immediately. It's almost always a waste of time trying to negotiate an exception, and sneaking a pet in is a disaster waiting to happen. In apartment communities with pet-friendly policies, you can be reassured that management and residents have a responsible attitude toward maintaining a pleasant atmosphere for everyone. What do you do when you're trying to convince a potential employer to hire you? Treat this as a job hunt for your pet. Compile a pet resume showing why your cat or dog would be a great resident. Items to include would be current vaccination records, letters of recommendation from previous landlords, and documentation of any completed training. Schedule an interview where a management member can meet your pet and ask any relevant questions. A pet deposit is a one-time fee paid upfront. It serves the same purpose as your own deposit, which is a guarantee against possible damages incurred during your tenancy. A pet fee is an additional amount added to your monthly rent. Before signing a lease, make sure you clearly understand all relevant deposits and fees and be prepared to pay them. A pet-friendly apartment community will most likely already have the terms spelled out in the lease, but if not, be sure to get an addendum in writing. This actually protects both sides from any misunderstanding down the road. Do you have more exotic taste in pets? In addition to dogs and cats, our pet-friendly Springs luxury apartment communities welcome a wide range of animals from birds to iguanas to ferrets. Stop by and learn more from a friendly member of our on-site management staff!